We already know the benefits of rooting any Android phone. By rooting any Android phone, you can install Xposed Framework and get the most out of Android apps. Not just that you can also customize Android phone with completely new custom ROMs. However, the process of installing recovery and rooting Redmi Note 3 is little time-consuming. If you follow the following step-by-step guide then it can make the process faster. Before proceeding, I will suggest you to apply for the official bootloader unlock process. Yes, its absolutely mandatory that you unlock the bootloader of Redmi Note 3 with the official method. Otherwise, you will end up bricking your phone and also updating MIUI will be cumbersome. There are lots of myths regarding unlocking the bootloader of Redmi Note 3. Some will ask you to unlock on 64-bit system and some will ask you to delete data on your phone. However, none of them are true. The official method to unlock the bootloader of Redmi Note 3 takes around 10 days. So forget installing recovery and rooting till then. How to unlock the bootloader of Redmi Note 3? Step 1: Go the official website for unlocking the Mi devices from here. Step 2: Click on Unlock Now button and login with the Mi account details. Step 3: Fill in the form with the valid reason to unlock the bootloader. Step 4: Wait for at least 3 days and you will receive SMS from Xiaomi. Step 5: Once you receive SMS, download the Mi Flash Unlock tool from here. Step 6: Connect your phone in fastboot mode and unlock it with the tool after 5 or 6 days. Very time-consuming right? But wait, you can do a lot more in between. Make sure that you have the same Mi account on your phone too. If possible, use login option with the mobile number only. In this mean time, your Mi account details will propagate through Xiaomi’s servers. During this period, you can flash the new developer ROMs with locked bootloader also. I have a YouTube video on that and you may check it here. Don’t forget to keep trying to unlock the bootloader everyday. Once you have successfully unlocked the bootloader, only then you can go ahead with installing recovery and rooting the phone. 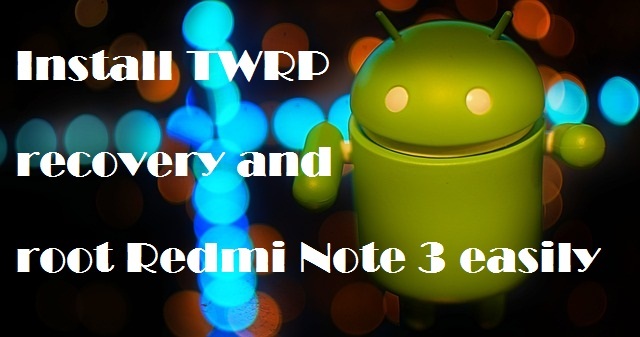 How to install TWRP recovery and root Redmi Note 3? When it comes to any Mi device, it has the privilege of updating to the latest ROM. Likewise, Redmi Note 3 too has this privilege. One can update their Redmi Note 3 ROM directly from the updater app. However, its absolutely flawless for non-rooted users because most of them just shift from one stable ROM to another. Things are little difficult for rooted users. To keep up with the incremental OTA updates, there is one different TWRP recovery which is called ZCX TWRP. You don’t need any SuperSu zip file on your Redmi Note 3 because this recovery has it already. Also updating through incremental OTA updates is easy with this TWRP. After you have unlocked the bootloader, go ahead with the following steps in order to install TWRP recovery and root Redmi Note 3. Step 1: Download the ZCX TWRP zip from here. Step 2: Connect your phone to PC in fastboot mode. Step 3: Run the flash.bat file from extracted files of the above zip. Step 4: Once your phone boots in recovery mode, select the English language. Step 6: Go to Advanced Settings and tap on SuperSu. Step 7: Swipe to flash SuperSu and reboot system. After this final step, your Redmi Note 3 will have TWRP recovery installed and also it will be rooted. Now with ZCX TWRP installed on your Redmi Note 3, you can flash incremental OTA updates without having to flash the new full ROM. How cool is that?